On April 5 – 6, the CU Board of Regents gathered in Berger Hall to discuss tuition, fees and other action items. The second part of the meeting addressed tuition and fee raises for students across the CU system in preparation for the 2018 – 19 school year. All action items were passed, except for the compensation resolution FY 2017-18 Budget Resolution at CU Denver. 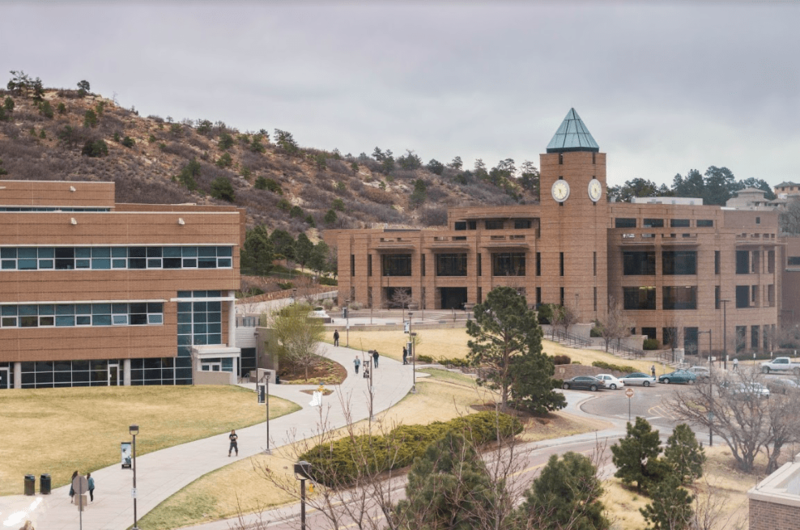 At UCCS, a 2.6 percent increase in the resident undergraduate base tuition rate, equalling $240, was approved April 6. Tuition for upper division in the College of Letters, Arts and Sciences will increase by 2.9 percent and for the Colleges of Business and Engineering 2.8 percent. 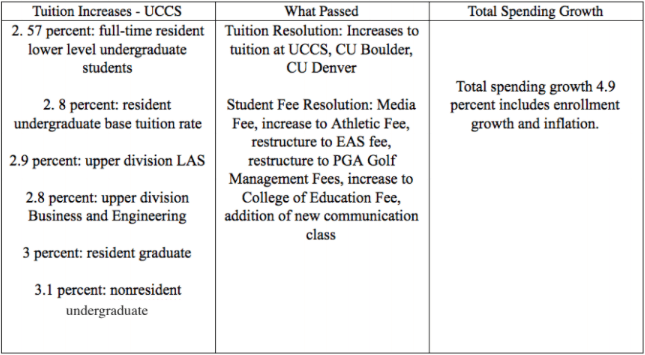 A $21 increase in fees at UCCS for the 2018-19 year was also approved. Fees to be implemented in the fall will include the media fee at $0.53 a credit hour and an increase to the athletic fee by $0.20 per credit hour. Housing rates will also increase from 1 to 3 percent, depending on room selection. The CU Board of Regents oversees the operations of the four CU campuses, including UCCS, CU Boulder, CU Denver and Anschutz Medical Campus. The board has control of tuition and fees, general affairs, hiring and promotion of university faculty. Over the last decade, student headcount increased in the CU system by 21 percent, per data presented at the meeting. A total of 65,000 students attend all four campuses. Resident enrollment also increased 11 percent and non-resident enrollment increased 52 percent. On the UCCS campus the state support and tuition compared to peers is $12,127 compared to $13,825. Compared to Boulder’s state support ($19,420 to $23,173), UCCS has a closer figure. At UCCS, the percentage of minority students has increased dramatically over the past 10 years: 32 percent of undergraduates and 21 percent of graduate students enrolled in fall of 2016 are racial/ethnic minorities compared to CU Boulder (24 percent and 14 percent) and CU Denver (43 percent). According to the agenda, systemwide, 27 percent of undergraduate students receive the Pell Grant. CU was also awarded over 10,000 baccalaureate degrees, which is 38 percent of the total awarded by Colorado’s public four-year institutions. The next board meeting will be held on June 21-22 at CU Boulder. The official board agenda can be found online at www.boarddocs.com/co/cu/Board.nsf.